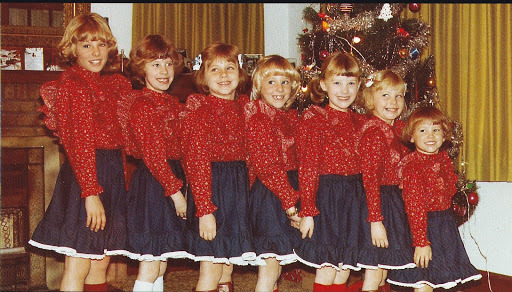 When we were little our Grandma (Ruth Wells) made matching outfits to give her grandchildren every year at Christmas. It was always the last present we opened and the one that drew the most excitement from this giggling pile of little girls. 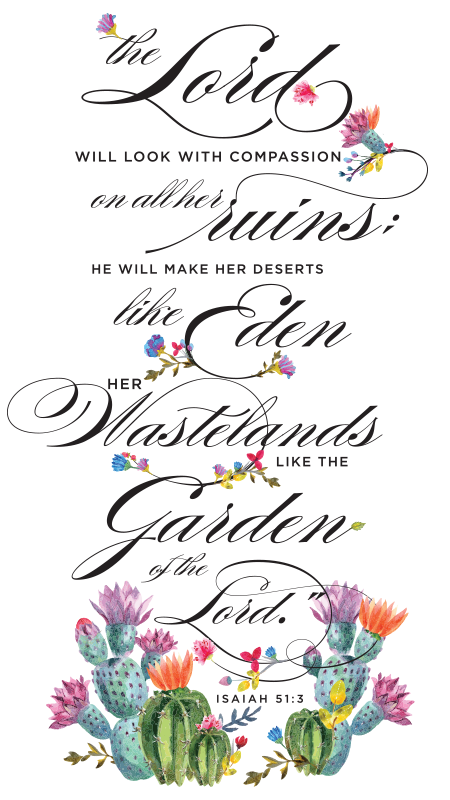 She would spend weeks measuring us and keeping her patterns and material hidden in her sewing room. And on Christmas Eve we finally got to see what she had been working on. We were never disappointed. 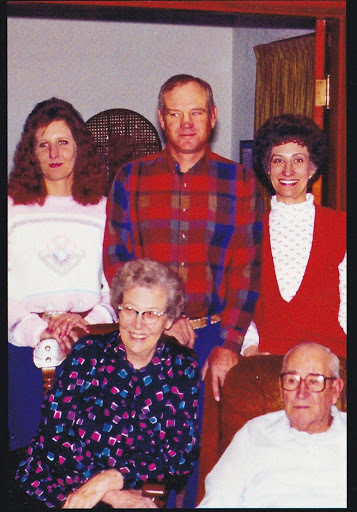 Once we had put on our new clothes and taken a thousand pictures in front of the old gas stove, Grandpa (George Claud Wells) would load us up in his pickup, or our station wagon, and take us all over town to show off our new duds. In the mind of a child, I used to think we were showing off what an impeccable seamstress Grandma was. It was a pretty amazing sight to see seven little girls walking up your sidewalk in matching dresses. 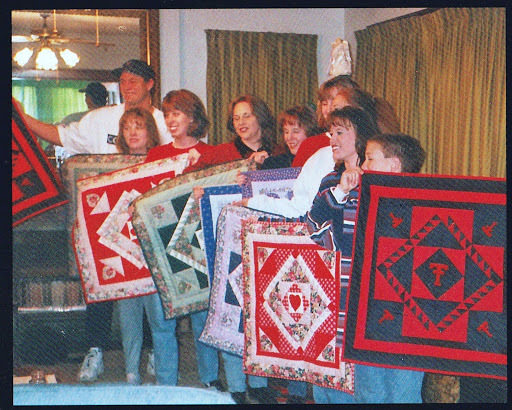 But later it dawned on me that Grandpa was showing off his grandkids as much as the beautiful work Grandma had done. Gosh, they loved us so much. When I think of the days Grandma spent sewing and wrapping those gifts, it brings tears to my eyes. Back then I knew it was something really special, but as an adult my heart can hardly handle how precious it was for her to do this and that we got to share it with our siblings and cousins. I think that was her point all along. Here is the first picture we have of matching clothes she made for us. 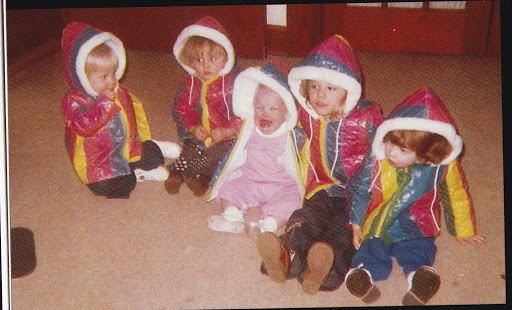 Little rainbow colored wind-breakers. This picture speaks to the dedication and determination of our mothers to get a picture of us together. Not one smile. Not one. This is 1977, so there were only five of us. There were still 2 little girls and a little boy to come later….. 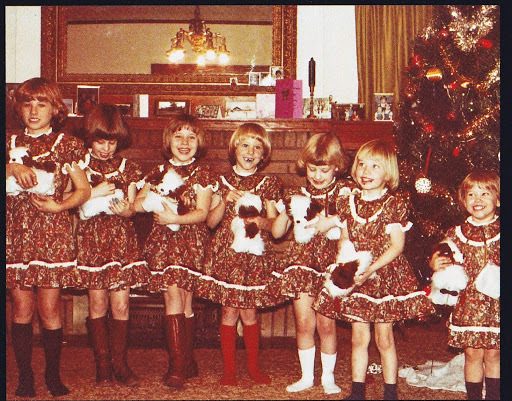 In 1978, Grandma got serious with the Christmas dress sewing. Look at these precious dresses she made! This was the year Altah joined our family. One of my favorite years was 1980. Grandma mixed it up a little bit giving Sarabeth and Amanda the peach dresses with brown blouses and the Wells/Morrison girls the blue. And I love the bottom picture with Grandma and Grandpa. Sarabeth, Abby and I were piled onto Grandpa’s lap and Kelly is posing with Grandma. Uncle Bob snapped the photo and accidentally caught Grandpa smiling. He wasn’t necessarily one to smile for pictures. top picture left to right: Kelly, Cassie, Sarabeth, Jennie. 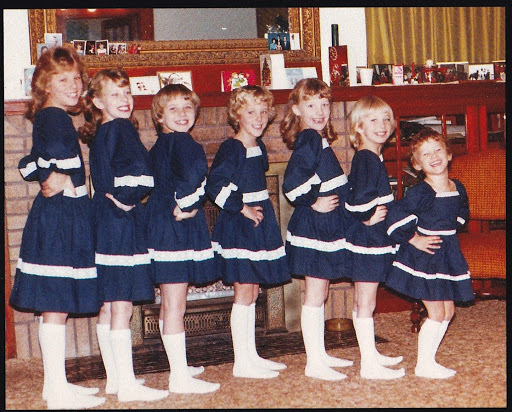 1981 ushered in the year of the cousin lineup by age. You can see our photos are getting a little more organized as we get older and our parents found ways to coax us into submission. This lineup continues today – almost every time we are together we line up and strike a pose. Note the mismatched, knee-high socks, oh dear! This year we even got matching puppy-penny banks to complete the ensemble. In 1982, Grandma made us matching prairie skirts and ruffled shirts. What little girl in 1982 didn’t want a prairie skirt? I thought these were SO STYLISH! And I’m amazed that our hem lines are all the same length even though we were different heights. Did she do that on purpose? I love the bows in Cassie and Altah’s hair. And Amanda and Kelly are holding hands. Just adorable. 1983, the year of the sailor dresses! This picture makes me smile because I imagine the conversations had by Grandma, Mom, Aunt Cathy and Aunt Sarah about making sure we had matching white socks this year. I have to admit, the white socks do complete the look. I also like to call this the year of the mullet. It will be with us until the late 80s….thanks Mom. 1984 – behold a son is born! Finally, after seven granddaughters they finally got a boy. When Matthew was born in June, Grandpa said to my mother, “Thank you, Chloie Jan.” I swear Grandpa has tears in his eyes as he looks at Matthew in this picture. He adored Matthew. And the feeling was 100% mutual. 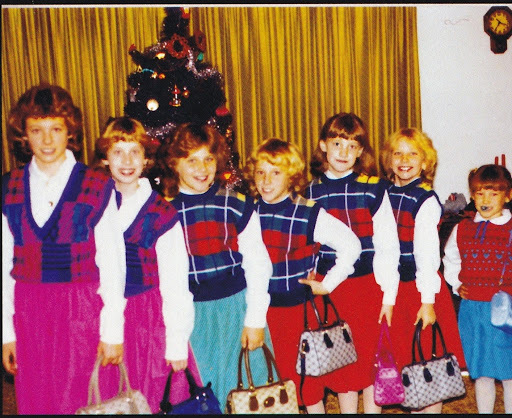 You can’t go wrong with the 1985 sweater vest and matching skirts. Sarabeth and I were excited to match for the first time ever. 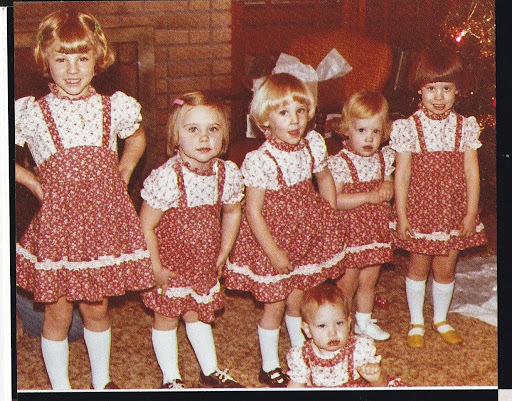 Grandma must have decided it was no longer cool to wear matching dresses to church with your sisters. But out of town cousins, no problem! And what better compliment to the vest and skirt than the faux coach purses! We thought we were so grown up. 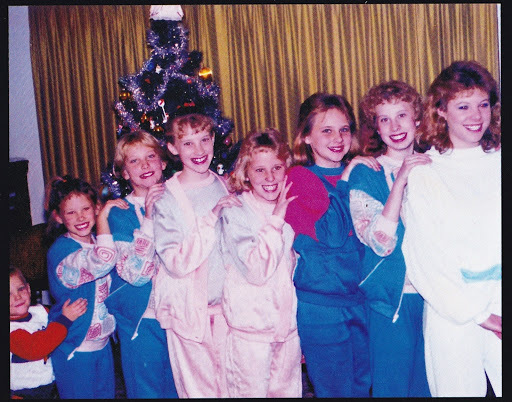 In 1987, nothing was more rad than a comfortable sweat suit. I don’t believe Grandma sewed these, but here we are nonetheless in our lineup with Matthew bringing up the rear. Matthew revolted in 1988 and decided he did NOT want to bring up the rear this year. So he is posed right in the middle and looking just like my nephew Sawyer. 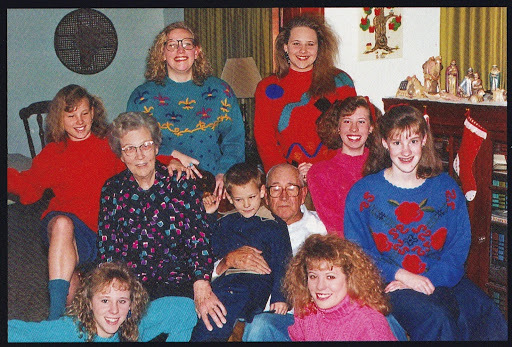 In 1990 Grandma gave us all beautiful sweaters. They didn’t match, but the theme is still the same. Note the nativity set over Cassie’s left shoulder. That was the neatest, most precious set of wise men, shepherds, Mary, Joseph and baby Jesus. You might not believe it, but Grandma let us take it all down and play in the floor with it every Christmas. Even after the angel broke her wing. I’d be embarrassed to say how old I was the last time I did that. This was our last Christmas with Aunt Sarah. She died December 21, 1991. I love this picture of Grandma & Grandpa with their kids. And I can hear Grandma’s laugh from here. 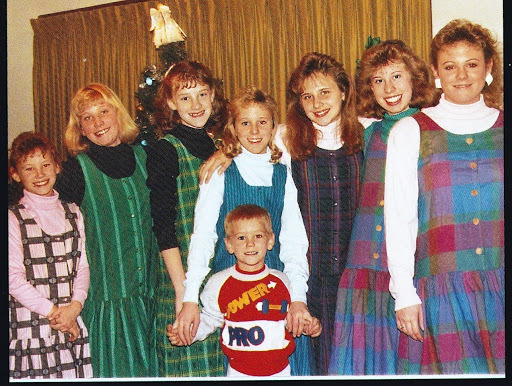 We celebrated Christmas 1991 just a couple of days after Aunt Sarah’s funeral. My Grandma made that decision without hesitation. She wanted us all to be together and she knew we needed each other. I love her for that. 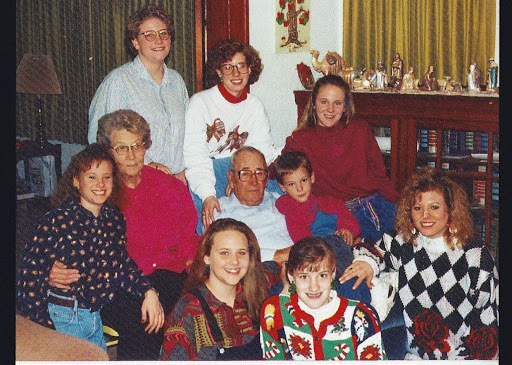 Christmas 1992 was our last holiday with Grandpa. He died in August 1993. He doesn’t look well in this picture, but he was content with Matthew in his lap. My Grandma used to say that Matthew added 10 years to Grandpa’s life. I believe that. 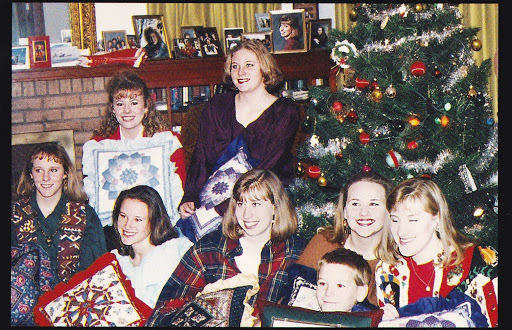 In 1993, Grandma made us all pillows. By the time we were this age, the kids’ table wasn’t just where the little ones sat to eat Christmas dinner. We were having very grown up conversations about all kinds of things, most of which will remain private amongst the eight of us. I think we realized after losing Aunt Sarah and Grandpa so closely together how much we loved each other. So we treasured each other even more and shared even more laughter and tears than ever before. 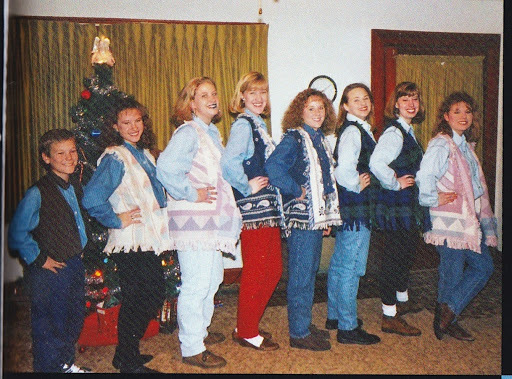 1994 was the year of the vests. And I somehow became the shortest member of the family. 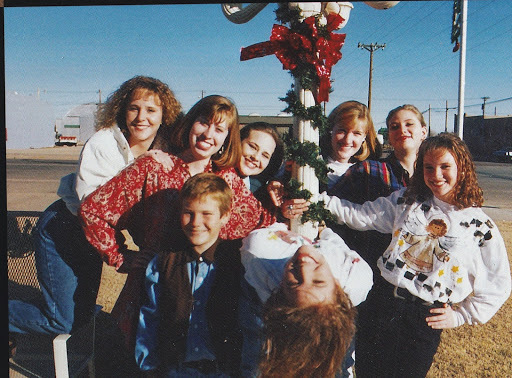 I’m sharing this picture because it was taken on Christmas Eve 1994 in downtown Tahoka. And because I’m upside down. Not sure whose idea that was. Another favorite of mine – in 1995, Grandma made us each a framed picture of a little girl wearing a dress made from the same material she used to make our dresses in 1981. And Matthew got a picture of a little cowboy wearing a coat made from the slicker Grandma had made him. You can’t see it, but he’s also wearing some shiny spurs! I think we all cried when we opened this one. 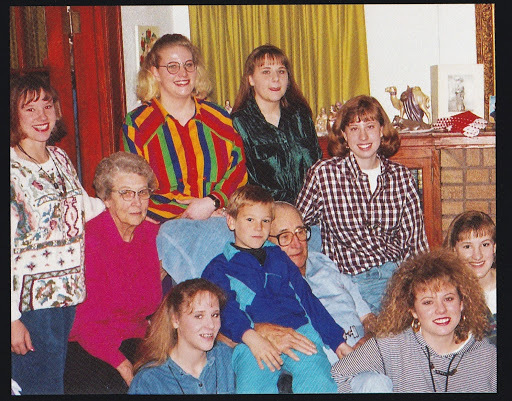 1996 was the last Christmas we spent at Grandma’s. It was also the year Erik joined the family. Grandma made each of us a wall hanging. Erik and Matthew got matching Texas Tech patterns. And for the first time I wasn’t the oldest! Erik took my spot at the front of the line which I loved. 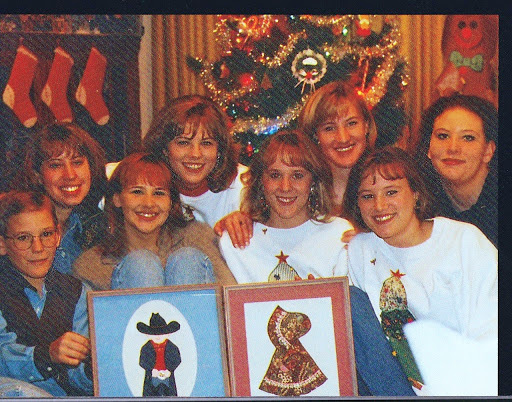 Christmas of 1997 we spent at Methodist Hospital in Lubbock. Grandma had been diagnosed with lung cancer that later spread to her brain. We were allowed to bring a little food into the hospital waiting room along with some presents. Then we wheeled her bed in and had Christmas as usual. Bryce was almost one, so he entertained Grandma in his little Santa outfit as he ran around charming the nurses and all of his cousins. Grandma died in March 1998. If you’ve taken the time to scroll through these pictures, thank you for letting me reminisce. 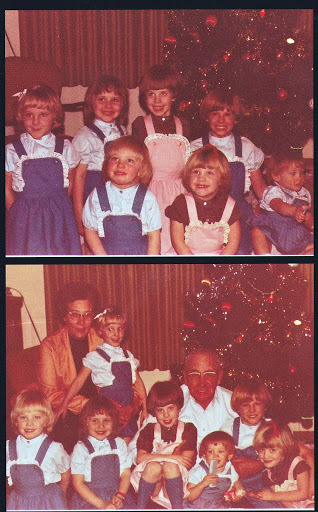 When I look at these photos I am overwhelmed with the sounds and smells from Christmas at Grandma and Grandpa’s house. If I close my eyes, its like no time has passed at all. But what I love most about these pictures are the faces looking back at me. I recognize my own kids in my brother and sisters. 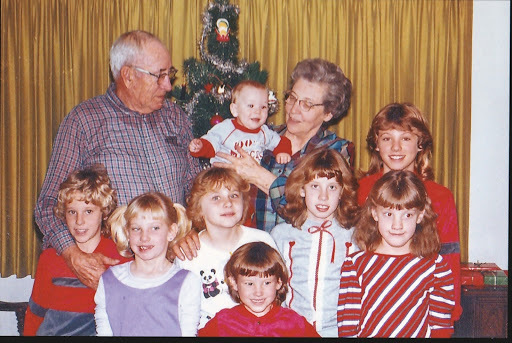 I recognize my nieces and nephews in the eyes of their great-grandparents. 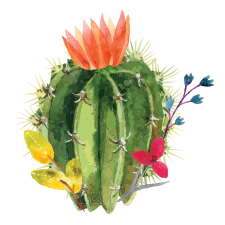 And I see all of us for who Grandma and Grandpa saw us to be – perfectly flawed, basically unblemished little pieces of delight who they loved and doted on as long as they could. If we could only love ourselves as much as they loved us. Simply beautiful. What a lasting heritage from your grandparents!